A liquid is traditionally defined as a material that adapts its shape to fit a container. Yet under certain conditions, cats seem to fit this definition. This somewhat paradoxical observation emerged on the web a few years ago and joined the long list of internet memes involving our feline friends. When I first saw this question it made me laugh, and then think. I decided to reformulate it to illustrate some problems at the heart of rheology, the study of the deformations and flows of matter. My study on the rheology of cats won the 2017 Ig Nobel Prize in Physics. The prizes are awarded every year by Improbable Research, an organization devoted to science and humor. The goal is to highlight scientific studies that first make people laugh, then think. A ceremony is held every year at Harvard University. At the center of the definition of a liquid is an action: A material must be able to modify its form to fit within a container. The action must also have a characteristic duration. In rheology this is called the relaxation time. Determining if something is liquid depends on whether it’s observed over a time period that’s shorter or longer than the relaxation time. Could the type of container be a factor? (In rheology this is studied in “wetting” problems.) Or does it vary with the cat’s degree of stress? (One speaks of “shear thickening” if the relaxation time increases with stress, or “shear thinning” if the opposite is true.) Of course, we mean stress in the mechanical sense rather than emotional, but the two meanings may overlap in some cases. What cats show clearly is that determining the state of a material requires comparing two time periods: the relaxation time and the experimental time, which is the time elapsed since the onset of deformation initiated by the container. 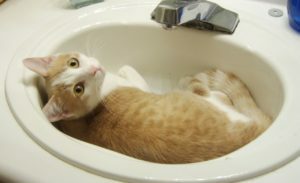 For instance, it may be the time elapsed since the cat stepped into a sink. Conventionally, one divides the relaxation time by the experimental time, and if the result is more than 1, the material is relatively solid; if the result is lower than 1, the material is relatively liquid. This is referred to as the Deborah number, after the biblical priestess who remarked that on geological time scales (“before God”) even mountains flowed. On shorter time scales one can see glaciers progressively flowing down valleys. Even if the relaxation time is very large (days, years), the behavior can be that of a liquid if the Deborah number is small (compared to 1). Conversely, even if the relaxation time is very small (milliseconds), the behavior can be that of a solid if the Deborah number is large (compared to 1). This is the case if one observes a water balloon at the instant when it’s popped. The Deborah number is an example of dimensionless number: Since we divide one time period by another, the ratio does not have any unit. In rheology, and in science more generally, there are many dimensionless numbers that can be used to determine the state or regime of a material or system. For liquids there is another dimensionless number that can be used to estimate whether the flow will be turbulent, with vortices, or whether it will calmly follow the outline of the container (we say that the flow is laminar). If the flow speed is V and the container has a typical size h perpendicular to the flow, then we can define the velocity gradient V/h. The inverse of this velocity gradient scales as a time. Comparing this duration and the relaxation time produces the Reynolds number in the case of fluids dominated by inertia (like water), or the Weissenberg number for those dominated by elasticity (like cake batter). If these dimensionless numbers are large in comparison to 1, then the flow is likely to be turbulent. If they’re small in comparison to 1 the flow is likely to be laminar. Asking the question of whether cats were a liquid allowed me to illustrate the use of these dimensionless numbers in rheology. I hope that it will make people laugh and then think. Marc-Antoine Fardin is a researcher of rheology at Université Paris Diderot – USPC. This article was originally published on The Conversation. Read the original article.